Injuries to intestine, vascular structures, spleen, and diaphragm are known complications of laparoscopic urologic surgery. Hemostatic agents have been used to repair some of these injuries. During a right laparoscopic radical nephrectomy, Bhayani et al. applied gelatin matrix with thrombin (Floseal) to a 1 cm tear in the diaphragm (46). A Babcock clamp was used to approximate the diaphragm, and the omentum was used to cover the repair. While preferring formal suture repair for large diaphragmatic injuries, the authors recommended the use of Floseal to treat small diaphrag-matic injuries. Fibrin sealant has also been used for repair of splenic injuries. Canby-Hagino et al. 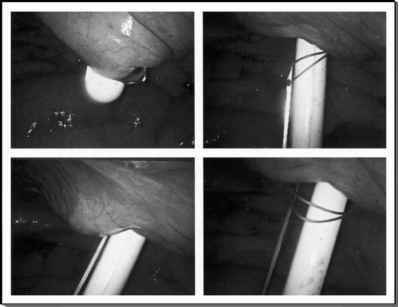 described utilizing fibrin sealant to manage conservatively a splenic laceration caused by upper-pole dissection during transperitoneal laparoscopic nephrectomy. Splenectomy was not necessary (47). ■ All hemostatic agents have the potential to be a useful adjunct to traditional means of controlling intraoperative laparoscopic complications. ■ Any complication should be managed with definitive measures that also prevent the development of additional complications. ■ There are no prospective trials specifically addressing the use of hemostatic agents for the management of complications occurring during urologic laparoscopic procedures. Bioadhesive/hemostatic agents may be used alone to manage a complication only in select cases.